The Pinta Pride Project aims to increase LGBT+ awareness within suburban communities and will culminate in an inaugural Pride celebration in June of 2019. Our story began as our brave daughter, Molly, shared her recent coming-out journey with our community in efforts of increasing LGBT+ awareness among young audiences. With an overwhelming amount of support and kindess from the local surrounding area, in September of 2018 we established The Pinta Pride Project Inc to formalize her efforts. Molly is a gay, 12-year-old student at Twin Groves Middle School in Buffalo Grove who was so inspired by Aurora's Inaugural Pride Parade last year that she just had to have one in her home town. She and her family have long been advocates for social justice issues in their town, but having many gay family members and friends, pride is the closest to home. Molly has always been lucky to have many amazing opportunities in the town of Buffalo Grove and has been a longtime actor, singer and dancer in Big Deal Production's shows. She is also an animal lover and enjoys spending time with her dogs and cats. She loves Pentatonix, Ellen, and reading. Molly has aspirations of becoming a teacher like her mom and dad, and continuing to run their new nonprofit, The Pinta Pride Project, to keep pride coming to Buffalo Grove every year and to support other young people in bringing their own events. Molly wants to make being gay normal and seen. Presented by BG Pride's Teen Team join us on May 19th from 7-10pm for a night of dancing, drag, and more. 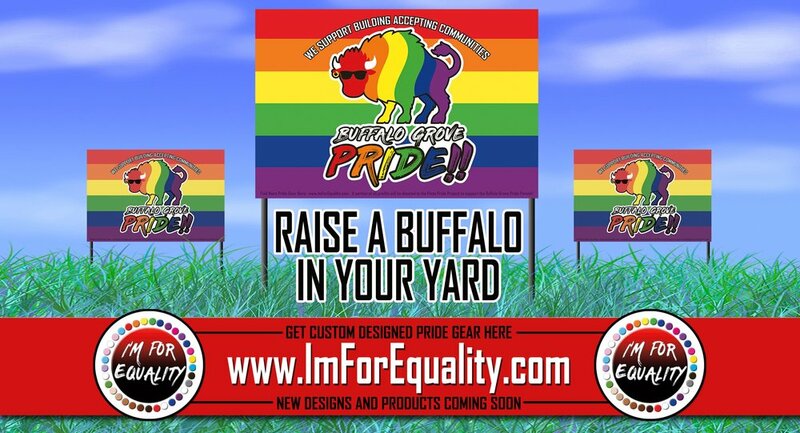 Alisa Kober is currently providing lawn signs in support of BG Pride through ImForEquality.com. Support her efforts here! The Pinta Pride Project aims to increase LGBT+ awareness within suburban communities and will culminate in an Pride celebration in June 2019. Thank you! Your pride is showing!